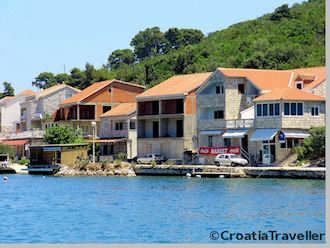 Polace, (pronounced poe-latch-eh) is on the northern coast of Mljet Island at the end of a deep and islet-sheltered bay. As Polace is next to one of the main entrances to Mljet National Park, it receives a fair amount of visitors in the summer, especially when there is a daily catamaran, the Nona Ana, connecting Polace with Dubrovnik (see more about getting to Mljet). 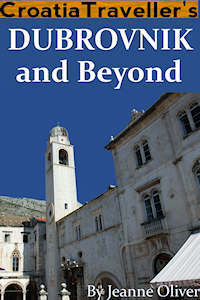 Yet, even at the height of the season, Polace retains the air of a traditional Mediterranean fishing village. The offshore islets--Tajnik, Moracnik, Ovrar and Kobrava--make the bay views most scenic. Polace has an ancient history. You can see the ruins of a palace that was probably built in the 5th century. The ground-floor plan was rectangular with two prominent towers facing the sea. Alongside the highest wall of the palace are village houses and the remains of an early-Christian church. There are no hotels in Polace but there is a smattering of private accommodation.